Cruises are an ever more popular way to holiday, but good travel insurance is critical - if you need hospital treatment you may need airlifting - don't risk having to foot the bill yourself. Cruising is becoming an ever more popular way to go on holiday, and as its popularity grows the demand for Travel Insurance that specifically meets the needs of those going on a cruise grows with it. If you are looking for travel insurance for cruises, whilst on the whole standard travel insurance can be used, there are some additional considerations to take into account. *with a single trip policy. Add optional long stay cover and the trip limit is 18 months. Age restrictions apply. * with a single trip policy. Annual policies allow up to 60 days per trip. Select a Cruise policy from the single trip destination options. Comparison service offers a range of benefits. Available online or call 0800 542 7166. Use voucher code MAX5 for a MoneyMaxim negotiated discount of 5%. If you have a policy that only covers a certain geographic area (i.e. is not worldwide) make sure that any destination you are likely to dock in is allowed. Some policies cover Cyprus and Spain as an additional category, others will not cover some countries at all. So when looking at geographic areas make sure you are covered wherever you will dock. Cruise ships offer an amazing range of activities both on board and on excursions so if you plan to use the climbing wall or pop off the ship to go camel riding make sure you are covered for any such activities. The last thing you need is to be stuck in a Marrakesh hospital without insurance with an injury after going on a quad biking adventure. Some companies offer cover specifically for cruises. This means they offer cover for areas such as cabin confinement (compensation if you are unable to leave your cabin as there is illness on the ship), missed excursion cover (covering the costs of pre paid excursions if you are unable to partake in them due to illness) or missed port cover (in case you miss the ship when it leaves port). 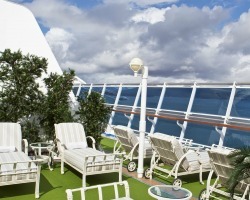 Insurance is important whenever you travel, but arguably even more so on a cruise ship. If you should fall ill and need hospital treatment it's not a case of a quick trip down the road in your car or by ambulance. You may need an airlift from the ship and the costs can be enormous. It is for this reason some cruise companies will not allow passengers to board without proper cover - they do not want a situation to arise where a passenger does not have the financial means to pay for the treatment or repatriation they require. It can be worthwhile considering a comprehensive policy, as features such as missed connection cover are valuable - a delay to a flight can lead to you missing your ship's departure and the consequent costs can quickly build - the few extra pounds paid for a good policy will then look excellent value.